1. 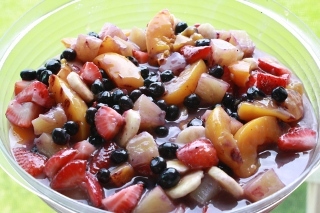 In a large bowl, combine peaches, pineapples, juices, and vanilla pudding mix. 2. Mix well until pudding is dissolved. 3. Stir in strawberries, banana, blueberries, and grapes. This was a really good salad! Next time I won’t use the canned juices though because it was too syrupy. I think I’ll measure the juice and substitute it with rice milk and maybe some sugar if it’s needed. The Environmental Working Group recommends you always buy certain types of fruit as organic.